A century ago, wood windows were first clad in zinc coated or zinc plated steel, with the object of making them fire resistant, and marketed under the trade name “Kalamein”. This name refers to the mineral calamine which furnishes the ore from which zinc, the eighth metal known to man, is produced. The reason it took man so long to get to zinc (India, c.1200 AD), is that it evaporates when heated, instead of melting. For millennia before that, however, calamine in its natural state was used in the production of brass and calamine lotion. While the trade name “Kalamein” seems no longer to be maintained, these terms persist, with reference to the general practice of cladding architectural elements in sheet metal of any composition. Wood windows clad in sheet metal, so called “calamine” windows, were historically intended as a defense against fire, but in this era of degraded lumber quality, the technique may continue to prove useful for the protection it provides against the damage done by time. There are many exterior features that are no longer viable in wood in today’s environment of uncertain lumber quality and aversion to maintenance. 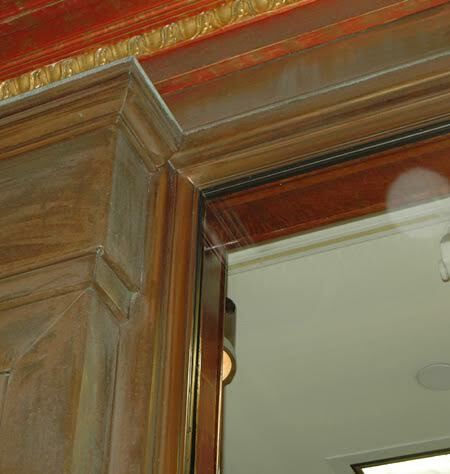 Red copper accepts finishes as reliably as wood, if properly prepared. And, like the original “Kalamein” windows, they are fire resistant. A well made custom sheet metal window is a more durable exterior element than any built with second growth lumber, whatever its species. They are not, however, cheap, so they will not be flooding the replacement window market. The price of custom calamine windows will deter their use in many applications. This entry was posted in Window Restoration and tagged Calamine Windows. Bookmark the permalink.